In the past, tabletop gas grills were seen as utilitarian cooking devices that were meant to quickly sear up some meat, while you got on to other things. You would see them most often used for trips to the beach, the occasional camping trip, and riddled throughout the parking lots of a tailgate party. The most common complaint you hear with propane-fired portable grills is that they just don’t bring the same smoky flavor that you get with classic charcoal grills. However, a lot of parks, parking lots and beaches have taken to banning charcoal, out of fire hazard concerns. The Smoke Hollow Vector tries to bring something a little special to this all too common complaint. 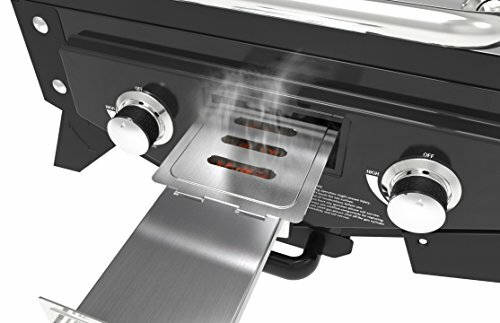 This grill has effectively married two high-quality stainless steel propane burners, with a small smoke tray burner. The propane elements are also covered with heat tents to help evenly distribute the heat, while also minimizing flare-ups. 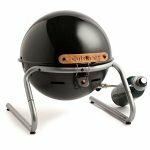 The end result is a portable table top propane grill that you can take with you anywhere, that allows imparts some of the smoky goodness you appreciate in a charcoal grill. The burners also come with a variable temperature gauge, which allows you to dial in the heat you want for the food you are cooking. 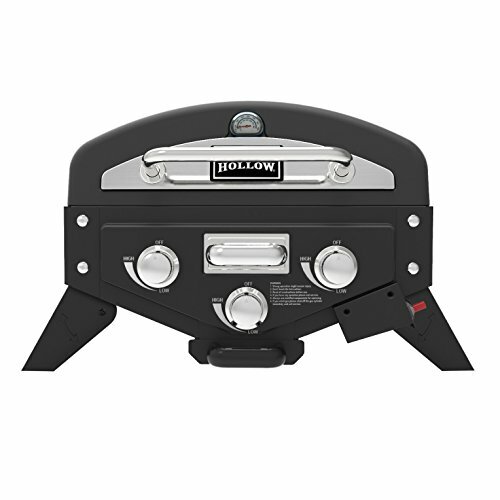 Smoke Hollow realized that material quality is a key factor in portable gas grills. All too often consumers sink their money into a unit only to end up with a super sticky grate, flare up problems, and burners that go out with the slightest puff of a breeze. So, they made a concerted effort to bring impressive quality to the components of the Vector. The three collapsible legs might stirrup some concern over the stability of the vector. Thankfully, it was designed with a broad footprint, so you don’t have to worry about it tipping while in use. The porcelain coated wire grill grates are also a sign of quality and something that is very rare for portable grills in this price range. Assembly isn’t overly hard for a gas grill. There are some smaller parts that might be tough if you have clumsy fingers. Still, you should be able to take it from box to your first grilling session in a little over an hour at most. The Smoke Hollow Vector’s two stainless steel propane elements produce 6,500 BTUs each for a total of 13,000 BTUs. The wood chip tray also produces 6,500 BTUs, and also contributes to the heat imparted to the food being grilled. If this were a smaller gas grill, these number might not be enough to impart a quick, and powerful sear. Yet the Vector with its heat control set to the max can get as high as 600 degrees. When dialed down it can reportedly get as low as 200! This means that you can slowly cook a bone-in chicken breast at one session, and still sear a ribeye the next. Just keep in mind that if you do want to put a high-heat sear on something, that you should give the Vector 5 to 7 minutes to preheat at full flame. The porcelain coated grill grates also help prevent problems with lean meats sticking. 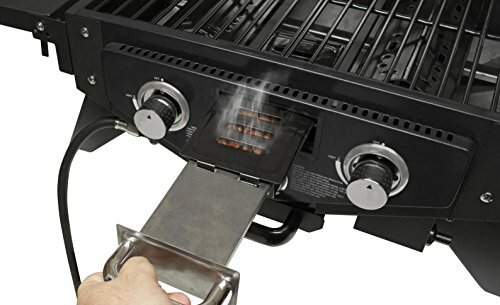 The wood tray is an interesting feature that both adds to the heat, while also contributing the smoky flavor that is so prized in charcoal grills. It can be prone to flareups during long grilling sessions. You can minimize this problem by soaking the wood chips in water for 3 to 4 hours before you fire up the grill. The Vector also has stainless steel heat tents over the propane burners. This isn’t something you find in most competitor grills. It helps to produce more consistent heat, while also minimizing flareups and reducing the chances of drippings clogging some of the flame ports in the underlying burner elements. The Vector comes with porcelain coated wire grill grates that measure in at 367 square inches. The chrome-plated warming rack is a nice touch but not necessary. The small wood chip tray with its own burner is a nice touch that imparts added smoky flavors, while also helping to boost the heat. The heat tents over the propane elements aren’t necessarily “Special” but they are relatively rare in other portable gas grills in this same price range. The Smoke Hollow Vector is relatively easy to clean. Once the wood chips have stopped burning, you can empty the ash and spent embers into a metal bucket. Stir in a little water to make sure all the heat is gone before disposing of the wood ash. You should never pour water into the ash cup as it could lead to long-term corrosion issues. The heat tents over the stainless steel burner elements reduce problems with clogged flame ports. It also helps minimize burned on gunk. The porcelain coating on the grill grates help prevent sticking problems. Most of the time you just need to lightly scrape them with a nylon or metal bristle grill brush. If you need to soak them in water to release some stubborn material, the porcelain coating will protect the inner metal from rusting. The Smoke Hollow Vector has a 1-year limited warranty on all parts with the exception of paint, which is guaranteed to be free of defects for up to 90 days. 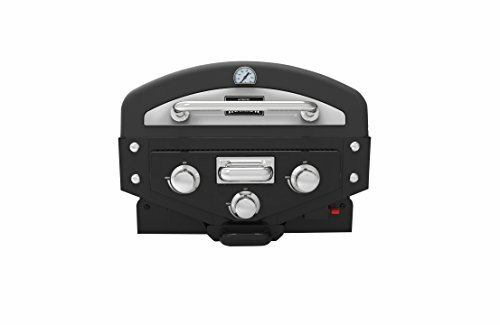 This is pretty much on par with all other high-quality gas grills in this price point. 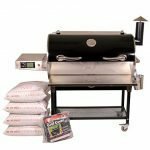 The Smoke Hollow Vector is a high-quality gas grill that also brings with it the ability to add a little smoke to the heat. Yet it also comes with a very friendly price tag. 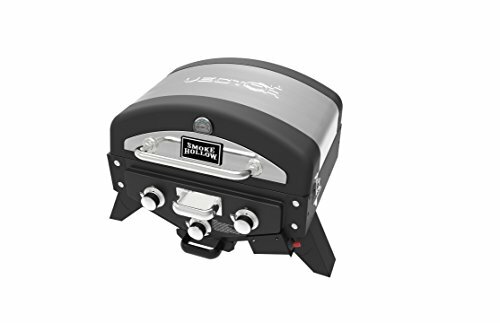 If you are taking your time to shop around for just the right gas grill, the vector should be a strong contender for your hard-earned dollar.